Davido has come out as the biggest winner bagging 3awards for the night. 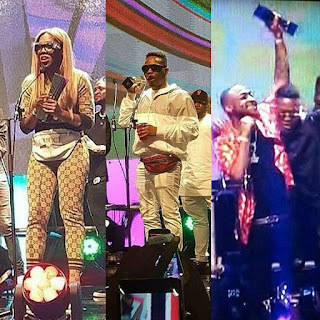 The DMW boss is closely followed by Maleekberry who beat Mayorkun, Dice Ailes and Small Doctor to pick the Best New Act award. .
Olamide, Wizkid and Tiwa Savage all managed to pick one each at the 2017 Edition of Soundcity MVP Awards which was held yesterday, 12th of January at the Eko Hotel and Suite, Hosted by the 2018 Big Brother Nigeria Host, Ebuka.